It’s a winter wonderland here in Breckenridge! Though the season might be half way over, we’re choosing to view the glass half full- full of 199 inches of snowfall that is! Now is the perfect time to break away and come visit us! Good Times – With the closest location to Breckenridge, Good Times offers extreme accessibility and extreme fun! Their most popular tour “The Good Times Classic” is there 2 hour tour which gets you a short practice session to get comfortable and then to the top of the Continental Divide which boasts spectacular views. Tours depart throughout the day starting at 9 a.m. Tour runs drivers $110 and passengers $55. Children 8 years and under are welcome for a price of $25. Good Times also offers an extended 3 hour tour which runs drivers $175 and passengers $80. Children 8 years and under are welcome for a price of $35. This tour is not recommended for children as it explores back country, Georgia Pass, and an extensive part of Good Times trail system. Bundle up and have some fun! Not looking to snowmobile while the gangs out? Stay back and join a group for some dog sledding. The guys at Good Times will take care of you! Looking for something a bit more extreme? 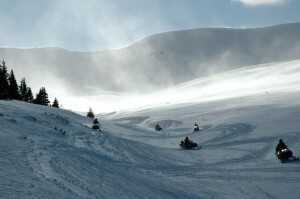 White Mountain Snowmobile tours offer Performance tours and Extreme tours that only take out single riders. Most are still 2 hour rides that challenge and bring you through high alpine valleys and powder filled bowls above tree line. Rates starting at $130 per driver with no passenger option. Nova Guides – Based out of Vail, Colorado, and offering full day and half day excursions, you will not be disappointed with their most popular tour, Top of the Rockies, that brings you through open meadows and stunning 360-degree panoramic views of the Rocky Mountains. All tours include door-to-door transportation, professional guide, top of the line Ski-Doo snowmobile, snowsuit, boots, and helmet. Morning half day tours and full day tours include lunch. Experienced snowmobiler but aren’t trailering your own rig with you? Nova Guides offer two hour rentals for as low as $150 per person. Nova Guides also offers more aggressive snowmobiles as well as longer rentals at a higher rate. Coming with a kiddo younger than 9? Nova guides has a youth snowmobile lap track at their main basecamp (Camp Hale) and is perfect for kids 5 years and older. If you trailer your own snowmobile, no worries. Vail Pass has some amazing back country access. For an interactive map detailing the trails, click here. Going on a snowmobile tour? Share your experience with us using #bestofbreck! https://www.bestofbreck.com/wp-content/uploads/2016/01/snowmobile-.jpg 1500 1500 Stefanie Van Der Kar https://www.bestofbreck.com/wp-content/uploads/2015/08/logo-332x156.png Stefanie Van Der Kar2016-01-28 22:47:402018-07-02 10:35:38Rev Up your Winter! Warm weather, snow and sunshine-this is what Breckenridge during the spring time is all about. Not only is the combination of warmer weather and snow the perfect recipe for a vacation to the mountains, the live music, Saint Patrick ’s Day festivities, and fun events throughout town make spring in the mountains the most favorable time to come. The skiing in Breckenridge is like no other in the spring. There is plenty of snowfall this time of year. The average snowfall during this time is around 60 inches! If you love to ride powder, this is the time to visit. The spring brings a lot of sunny days as well. Spend less time warming up in the lodge and more time on the hill! Saint Patrick’s Day is always an entertaining time to be in Breckenridge. There are tons of specials throughout the pubs in Breckenridge. Watch groups of people dress up and celebrate the holiday as they march throughout Main Street or join the festivities and hit a pub! Burke and Riley’s as well as Salt Creek are some of the local’s favorite places to celebrate this holiday. New this year is “Who’s Your Paddy” 5k race. Awards/prizes will be given for each individual race. Registration goes until 10:30 am the day of the race at the Colorado Mountain College. After a day of powder grab a bite to eat and drink while enjoying a concert at the bottom of Peak 8. There are also fun giveaways and events going on. Come soak up the fun in the sun and enjoy all the festivities Spring Fever has to offer! Right off of Main Street, local beer vendors line up with tents full of beer for the Breck Spring Beer Festival! Starting at just $27.50 per person, this event is one you won’t want to miss! Check out some of Breckenridge and Summit Counties finest breweries along Ridge Street, just one block up from Main Street. Make sure to check out the live music, funky costumes, giveaways and family filled activities at this great event! For more information click here! Spring time in the mountains is by far one of the most exciting times to visit. Click below for a special discounted deal on lodging with lift tickets included! The International Snow Sculpture Championships are here! Watch these 12 foot high snow cubes transform into illuminated works of art at the Riverwalk Center or watch live performances, fire sculptures, music and more at the Fire Arts Festival in Breckenridge this weekend! 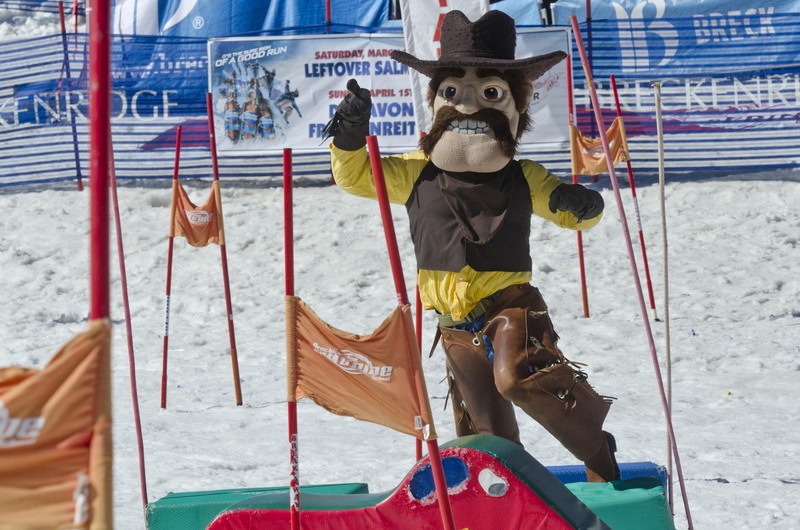 There are tons of fun activities going on Breckenridge. Click here for more information on all these festive activities and more! When most people think of Breckenridge, mountain sports are usually the first things that come to mind. There’s all types of activities here in the heart of the Rockies, such as: skiing, riding, biking, snowshoeing, hiking, dogsledding, rock climbing, snowmobiling, camping, tubing, skating and….shopping? Yep, shopping! Since mountain towns are often associated with rugged landscapes and harsh conditions, the world class retail therapy opportunities here are often overlooked. But, today’s your lucky day. 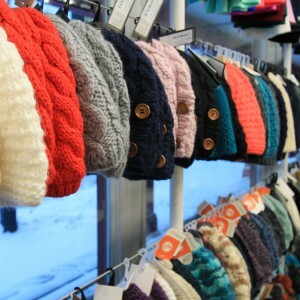 The BOB staff have compiled the ultimate Breckenridge shopping guide to satisfy every consumer’s palate. With over 200 stores in town, you’ll be sure to find something to write home about. Below, we have listed some of our favorites with links to their sites, sorted by category. Now that you know what your options are, you should know when is best to buy. If you’re not a skier or rider, we recommend shopping while others are skiing. The shops will be less crowded and you’ll be able to visit more stores quicker between the hours of 10 AM – 3 PM. Otherwise, happy hour is always a good time to get the stores to yourself and enjoy some libations in between transactions. Have you ever seen a snow sculpture that is almost as tall as a one story house? Well, you’re in for a treat! 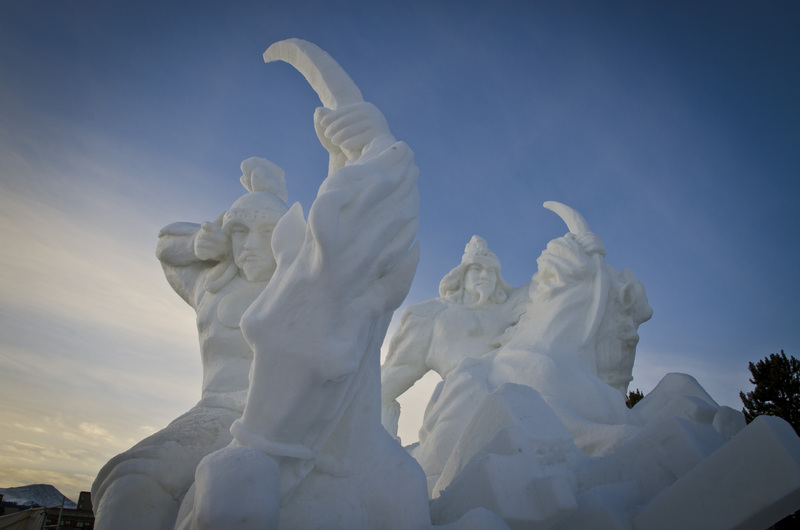 The International Snow Sculpture Championships hit Breckenridge starting January 18th! 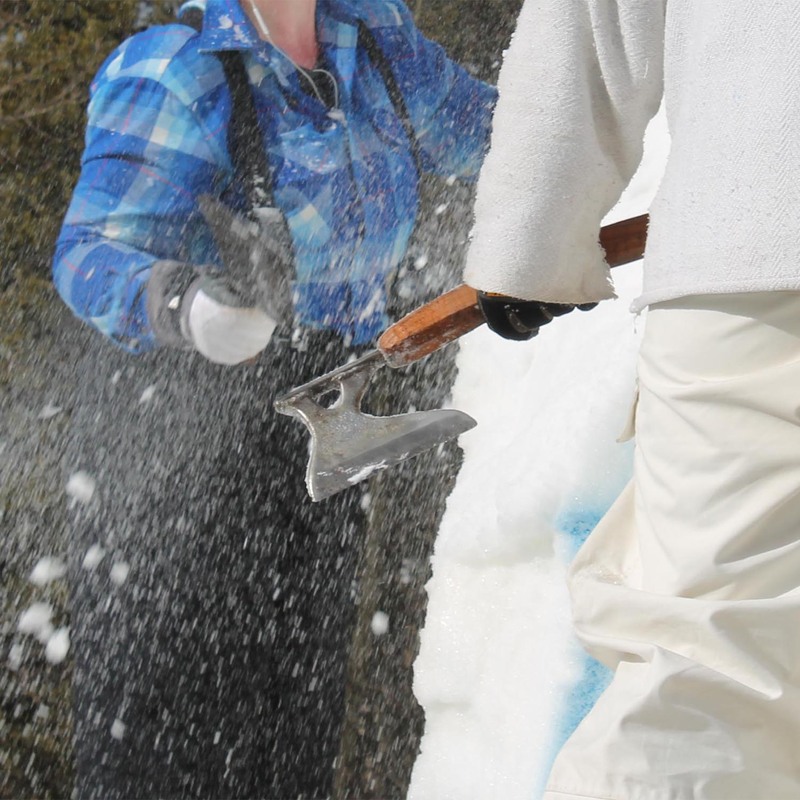 This 26th Annual competition brings 16 teams from all over the world to Breckenridge to show off their carving skills by creating larger than life masterpieces made out of snow and ice. Located at the Riverwalk Center in the heart of Breckenridge, this event lights up the town with gigantic glowing works of art and is accompanied by a “Thaw Lounge” and live music. Here’s the low down on all the happenings. What is stomping week you might ask? 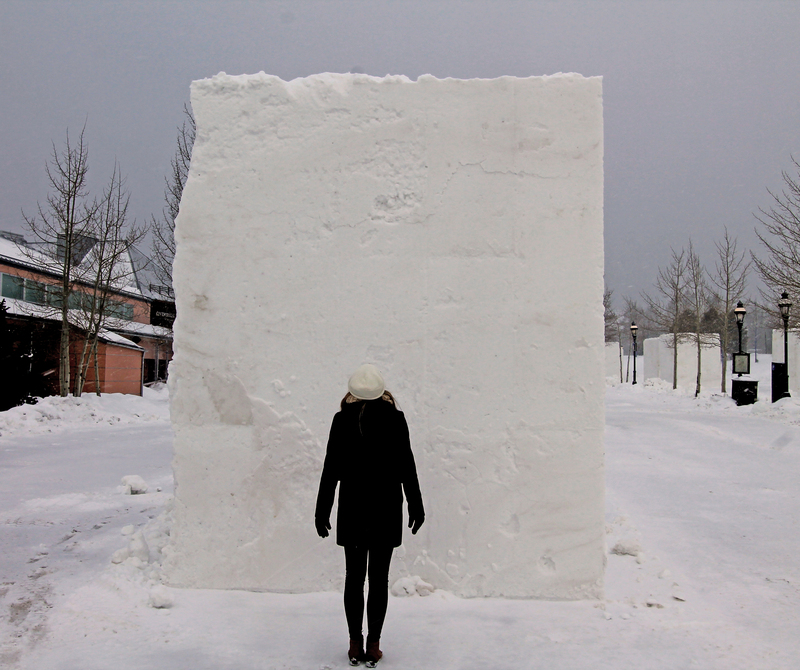 Stomping week is when huge piles of snow are transferred into ten-foot high square molds and transformed into massive cubes that serve as the sculpture teams’ canvases. Snow blowers shoot a layer of snow in the molds, then volunteers climb over ladders into the cube and compact the snow. This is repeated about 20 times until the “stompers” reach the top of the molds. Come volunteer to “stomp” the snow and get a good work out too! This event will close with a “block party” and concert at the Riverwalk center. Hazel Miller will perform for this free event that starts at 7pm. This is the week when viewers have the opportunity to actually see the sculpting action taking place. Each team is hard at work, crafting their cube of snow into a colorful glowing statue that will become part of Breckenridge history. Take turns guessing what each sculpture might transform into or gawk at the amazing progress that is made in just a few hours! On the last night of sculpting, the teams will be out at all hours of the night finishing their pieces before judg ing begins on Saturday, Jan 31st. You also have your chance to vote for your favorite team anytime throughout this week until February 1st at 2 p.m., so make sure to cast your People’s Choice Vote and submit it in a voting jar or directly to a volunteer with your $1 donation in support of the Championships! New this year, the Fire Arts Festivals meets in conjunction with the International Snow Sculpture Championships. Stay warm by checking out all this festival has to offer! These activities include, fire sculptures, performances, demos, live music, and more! Signup for a workshop or check out the scheduled performances and music by clicking here! Check out all the sculptures in their glory at the Riverwalk Center! These sculptures are radiantly illuminated with vibrant colors at night for an unforgettable experience. The “Thaw Lounge + Music” at the Riverwalk Center will also be open, so warm up inside and grab some postcards and pins while you learn about the origins and history of the 25 year old International Snow Sculpture Championships. There will also be series of live music inside the Riverwalk Center for your enjoyment. This magical event illuminates 10ft high snow sculptures at night for a unique and fun experience that is sure to be a fond memory for years to come. Click below for more information about parking, lodging and more! For directions on how to get to the event click here! For more information on this event click here!